A while ago, I mentioned an interesting Kickstarter project by Julia Okrusko called Legends: Fantasy Violin. I am excited to announce that it is being released this month as a CD. Anyone who hasn't already heard the sample track can do so here: http://www.fantasyviolin.com/story.html. Julia also has a music video on youtube. 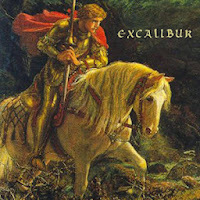 It was such a success that Julia is working on another Kickstarter for her new single Excalibur, part of an effort toward a second album of medieval-inspired music. Legends was a great album and perfect background music for tabletop fantasy RPGs. Anyone interested in supporting her latest project should check out the Kickstarter page here: Excalibur. Legends: Fantasy Violin can be purchases on ITunes, Amazon and Here. Turkey as a soloist and member of chamber ensembles. Since her arrival in Boston in 2005, Julia became one of the most sought-after violinists in New England, and has collaborated with all local orchestras - including Boston-based Video Game Orchestra. It was the VGO's "Back to the Future" project (2011) and working under distinguished composers Alan Silvestri, Lucas Vidal, and Wataru Hokoyama, that inspired Julia to start composing cinematic fantasy music for violin and orchestra. In 2013, Julia's self-released album "Legends: Fantasy Violin" received tremendous support and full funding on Kickstarter, and two tracks from "Legends" were nominated for Hollywood Music in Media Awards 2013. 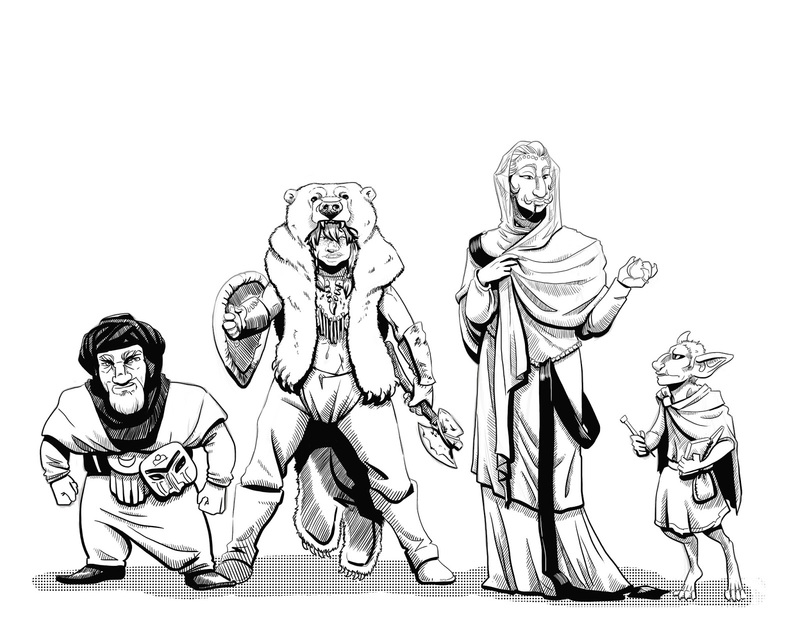 From left to right these are: Ogre, Human, Elf, Halfling, Hasri, Dwarf, Gru, Orc and Kobold. But let's look at each one briefly. 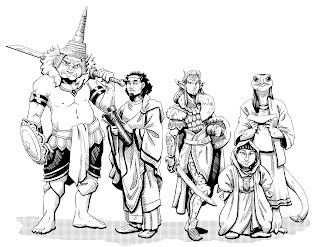 At character creation, players choose a race and a background. Each character reflects both of these components. The ogre in the image is a Leader. The ogres of Gamandria are descended from a great civilization, Nong Sai, and the inheritors of an ancient curse that befell them when their last great king killed a god. Once the most advanced culture on the continent, the ogres now exist on the edges of civilization, often as nomads. The reptilian looking humanoid is a Hasri Performer. They are detailed in a previous blog entry: here. The human is a Ronian Scholar, a member of a dying empire in its last revival. The elf is a Mandaru Warrior. The elves of Gamandria are detailed in a previous blog entry: here. The Halfling is merchant from Shahr. Halflings were also described in a previous blog entry: here. The figure on the left is a Dwarven Jack-of-all Trades. Gamandrian dwarves are associated with mining and stone like those in other fantasy settings, but they are also called by their god to avoid violence. Due to the necessity of war, dwarves hide their sins by wearing masks in battle. The second figure is a Gru Warror or Farmer. Gru are a race from the north. They are known for their violent coastal raids and worship of the great bear god Sur Vanker. Gru are also proficient whalers. The third figure an Orc Leader, an aristocrat of the Caelum Republic. Orcs in Gamandria belong to a great and growing empire. The last figure is a Kobold Scholar, a slave of the Caelum Republic. Kobolds often serve orcs as servants, courtiers and slaves. The art for Sertorius is coming in and it looks fabulous. I really like the cover art by Michael Prescott, which captures the exact tone and feel of the game. Jackie Musto, our interior illustrator, has done an excellent job creating the visuals for races and other aspects of the setting. I hope to have some previews soon. The art for Sertorius will be our best so far. The rules are basically done, we are just in the final stages of improving spells and new rules. We also went back and revised some of the older network mechanics. A few places needed fine-tuning for the setting. Our setting material is complete. I am just working on the appendices, which I saved for last because it builds on the existing material. The appendices will include titles by region, encounter tables, etc. Rob Conley is working on the map of Gamandria. He worked with us before on Arrows of Indra. It will be a classic hex map of an entire continent (in color for the PDF and black and white for the print edition). BD: Can you talk a bit about your gaming experience? RI: Like everyone, I started with Dungeons & Dragons. In my case I was living in Idaho, and it was the Holmes version of the game. I was in the fifth grade, and one of my friend’s older brother had the game. From there we tried other games. Basically I was hooked. I was lucky in that I lived in Idaho, and the west coast influences were prevalent in the scene. By this time games like Runequest, Arduin, and the like were easy to find and these were things we played. BD: Why did you decide to take the plunge and start your own game company? RI: I had games I wanted to design, and I was tired of freelancing and making compromises in the design process. I was the Director of Traditional Games for Zeitgeist Games, and this was a learning experience in many ways. James Maliszewksi (who was my Blackmoor Line Developer) and I decided it was time to do our own thing. This led to Rogue Games. It was a chance for us to design the type of games we liked. In James’ case it was Thousand Suns, in my case it was Colonial Gothic, and then Shadow, Sword & Spell. BD: You have two rules at Rogue Games. The first is have fun. The Second is “The setting defines the rules, the rules do not define the setting”. Can you talk about what this means in practice and what kind of settings and games it produces? "Have fun." For me this is the most important thing I keep in mind when I am designing anything. We play and design games. One of the main byproducts a game produces is fun. It does not matter what type of game you are playing. It can be Grey Ranks, a LARP, Call of Cthulhu or even Rolemaster. At the end of the session, you should have had fun. If you did not have fun, then for me, the game is a failure. So fun should not just be fun in the playing of the game, it should also be in the designing and creation of the game. I know this runs counter to most design advice, but I have found that if you are not having fun while you design a game, then the finished product is not going to be fun. So no matter what I work on, be it a rulebook, sourcebook, adventure, if I am not having fun during the design, the whole game is not going to be fun when finished. As for the second rule—The setting defines the rules, the rules do not define the setting—this is what design comes down to. Often, most games fail when designers try to take existing rules and mesh it into the setting the want to design. A setting is anything where the game action takes place. So it can be a board for a board game, a tabletop for a miniature game, or a card game. There are many ways to model mechanics, but there are not many ways to model a setting. For example, you want to run a horror game based loosely on the Abbot and Costello Universal Monster Movies. Why would you use the Call of Cthulhu rules, or create a Fate mash up, when you could simply use Toon, or come up with your own simple mechanic to emulate the tone you're trying to achieve? This is what I mean by letting the setting dictate the rules. BD: You’ve also designed card games in addition to RPGs. How is RPG design different from card game design? RI: I love designing card games. In fact I am currently working on a couple of new designs as a freelancer with another company and I am very excited about this. Card game design is different because there are a lot of moving parts. You need to balance the game play, the mechanic, the type of cards, the probability of the card types coming into play. Not only that, you need to ensure that decks are not under powered or over powered. 1. How do you win the game? Last player standing? Most points? 2. How does game play work? 3. What am I trying to emulate? The answers to these questions will guide me in my design, and help me create a game that accomplishes what I am setting out to do. When I designed Geek Wars, I wanted a game that all a player would need would be a deck of 60 cards. The purpose of the game was to emulate army of geeks—Role Playing Gamers and Wargamers—who were fighting over control of the con floor. With that premise, I knew I needed to have troop cards, as well as effect cards which allowed for the enhancement of troops or trigger events against the opponent. The troop cards have a point value which is used to attack opponent. These troop cards are able to be stacked, so that by sending more troops against tough opponents, you increase your chance to win. By destroying your opponent's army. That was not all I had to worry about. I had to worr if both decks were balanced, and that both decks would have an equal chance of winning. I did not want the wargamer deck to be so powerful, that the opponent did not have a chance to win. Even so, I needed to make sure the game carried the tone I wanted it to have. Geek Wars is humor, it is parody, because of this, the cards, and game play could not take itself too seriously. At all times during the design process I had to make sure the game was funny. BD: When you read an RPG, what do you look for? RI: Fun. Seriously. If a game does not look to be fun, I am not going to play it. I know it sounds simple, but that is what drives me. I mentioned Grey Ranks before. I love this game, and though you would not equate "fun" with the subject matter, the game is fun, because it allows you to explore themes that are not often found in other games. I do not like GURPS, and that is not due to the design, but due to me not finding the game fun to play. Is the design a failure? No. It just means that the rules, just do not offer me a fun enjoyable time. Still one I get past the fun, the game needs to offer me something different. 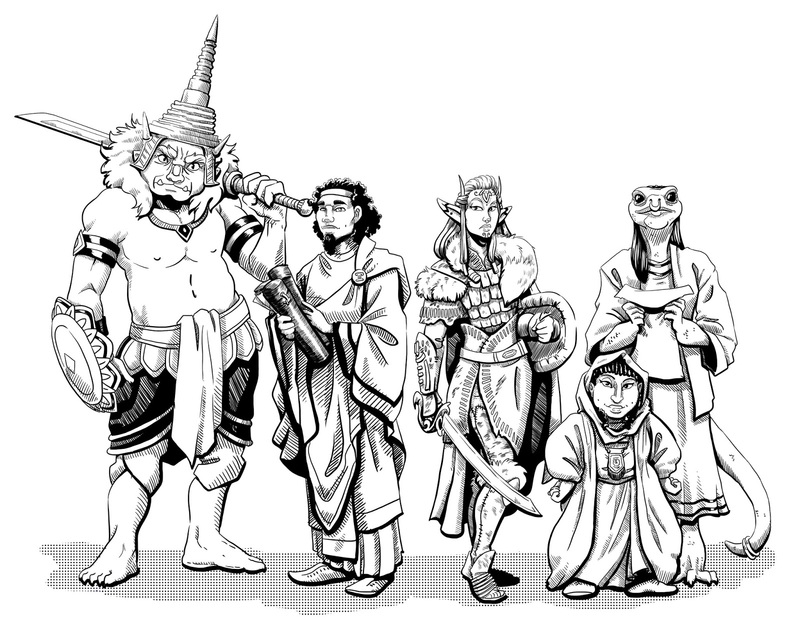 Case in point: D&D and retro clones. Why do I need a clone when I can simply play Basic and Expert D&D? Granted I still have my red and blue box, if the mood strikes me to play D&D, I am going to go to the source and avoid the clone. However, in cases of these games doing something different, that is what is what grabs me. Arrows of Indra (and this is not a paid for plug :) ), is a game I really enjoy. Granted I did the layout of it, but this is the type of game I really like. It sets out to do a specific thing, and does this perfectly. I wish more game designers would try to create a game that says and does what it means to do, like this. BD: When Colonial Gothic was released, I immediately wanted to play. I knew from the name alone what the concept was, and I also knew it really hadn’t been done so exhaustively before. Where did the idea for Colonial Gothic come from? RI: Thanks, Colonial Gothic is a labor of love. Colonial Gothic came about because when I was in the 8th grade I was tired of fantasy. I was tired of elves, dwarves, and the same old same old. I wanted something different, and I wanted something that took Legend of Sleepy Hallow and mixed it with Last of the Mohicans. I wanted colonial witches and the like, and I could not find anything that did that. So the seed of the idea finds itself to a lazy late May afternoon, and my sitting outside thinking about the type of game I wanted that did this. I explored using Boot Hill's rules, and later Marvel Superheroes, and as the years went by, the idea changed, was revised, and it would not be until college, that I took the game into the area it is now: the supernatural as seen through the eyes of the colonists. BD: The Colonial Gothic line has really grown over the years. The game itself has also been refined. You have had one revision and a new edition since its release. How has Colonial Gothic evolved and how has your approach to the line changed (if at all)? RI: The game has gotten more focused, more refined, and has grown up. The first edition was good, but it was a let-down to me, because I failed in the design. I listened to too many people and did not listen to myself in designing the game. Revised was me making the game what I wanted it to be. It was this version which really renewed my desire to work on it, and grow it. It was also this edition which led to Graeme Davis joining me in the wiring and growth of the whole line. Graeme has really pushed me, and made me focus and make this game better. 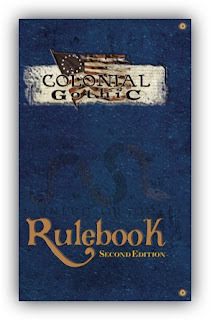 Second Edition, is it, this is the rules, refined, revised, and the game in its' final form, if you will. It is the game I always knew it could be, but I did not know if I had it in me to create. During all of this, the approach to the game has been the same. Create a game that I would want to play. BD: Can you elaborate on how listening to too many people negatively impacted the design process? How should designers process feedback and criticism? the mythical "perfect" gamer. This is why most games fail. Maybe not economically, but as a means of fun. Games should be fun. Period, Fun can be defined in any way you want, but for me, fun means you want to not only play the game, but finish the game. Designers should design more for themselves, and less for others. Make the game you want to make. Let your enthusiasm infect your design. Gamers will, and do, notice that. As for processing feedback and criticism, ignore what it is not important. If combat is an issue with your game, and the comments and feedback you get all deal with this, that is what you fix. That is where the breakdown is happening, not with lone comments like: "I hate elves," "I do not like how this game reads because there is not enough 'fluff'," or my favorite "you misspelled a word on page 236 of the Word file." It all boils down to what I have been saying: design the game you want. BD: Can you talk a bit about the 12 degrees system that you use in both Colonial Gothic and Shadow, Sword and Spell? RI: 12 degrees is the type of rule system I like in that, it is easy to learn, easy to run, and adaptable to any situation I need. I wanted a rule system that could be easily added to with little difficulty, as well as a rule system that I could easily transport to other settings. Originally I wanted to use BESM for my rule system, but when GoO imploded, I decided to create something that was my own. James, when he was my business partner, liked it and we worked on the rules together using it for both Colonial Gothic and Thousand Suns. Every game we worked on we tweaked, and refined the rules, and this work really has set the rules into what they are today. Colonial Gothic Second Edition rules is the product of this. If you like rules light, you will like 12 Degrees. BD: You call Shadow, Sword and Spell “Humanistic Fantasy” and point to Robert E. Howard’s Conan stories as a major source of inspiration (among other pulp fantasy writers). How does Shadow, Sword and Spell bring this kind of fantasy to the gaming table? Ok, that really is not a good answer. 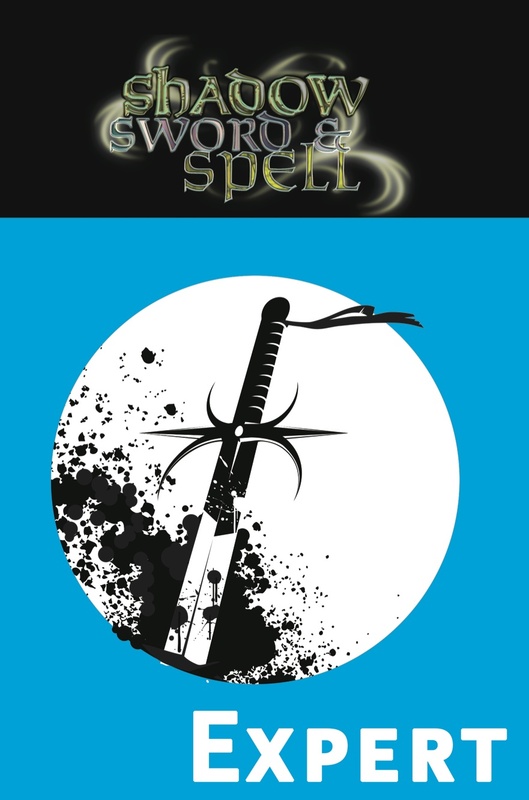 Shadow, Sword & Spell is fantasy has seen through the lens of Howard, Smith and Lovecraft. It is a pulp fantasy game where the heroes start out not a strong, but with the desire to be stronger. I wanted a game that would show how Kull got to "With this axe I rule." I wanted a game that was gritty, that was dangerous, and that really felt like you were playing Howard. 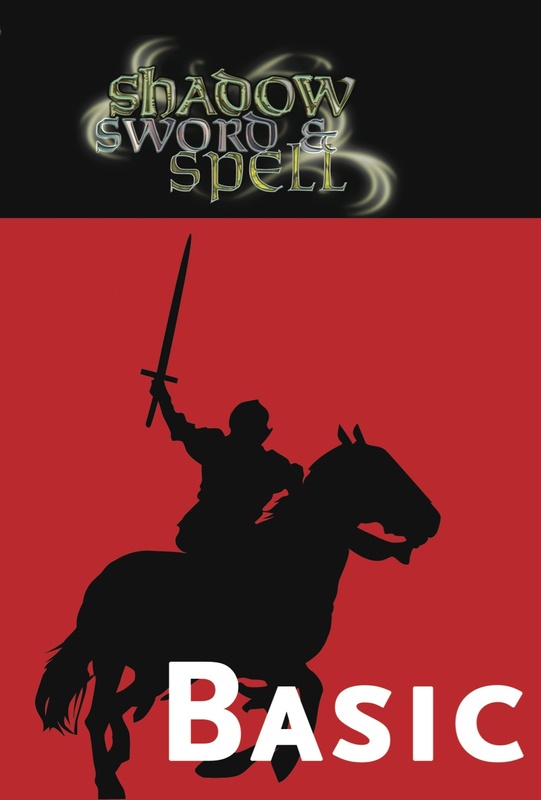 BD: Did you learn anything from your experience designing Colonial Gothic (as well as releasing it and supporting it) that you could apply when you began work on Shadow, Sword and Spell? RI: I stayed true to what I wanted to design. I did not listen to others, and created the fantasy game I wanted to play. BD: How did using an original system, shape the development of the end product? RI: It didn't. Once I decided to not used Savage Worlds, or BESM, and let it be its' own thing, I let it be its' own thing. You could argue, and do so very effectively, that the influence of a rules light, quick to learn game, is what carried over to the design. BD: You have said “with the exception of fatal, there are no bad games”. Do you think people are overly critical of RPGs? RI: Yes. There is too much philosophizing about games and not enough playing. Period. There is nothing wrong with talking about games, comparing games and rule choices, but if that is all you do then you are missing the point about games. Games are meant to be played. They are meant to be enjoyed with others. I will not understand the fan base who simply read a game, and never play it. I have a friend who preaches how every game to should be like Burning Wheel. Every time the topic of games comes up, his reply is that Burning Wheel would have done it better. Has he played Burning Wheel? No. Does he play any games? No. He likes to read game, but does not have the time to play them. Mind you I have made the offer countless times to have him join my group, and every time he responds he does not have the time. This is not a gamer, this is a reader. Sadly there are more readers, it seems in this hobby, then gamers. That is not to say that Burning Wheel is a bad game, I respect it for what it is, but not every game, or rule set is suited to every style of play. BD: How do you feel about the state of the hobby and the state of design today? RI: That is a hard question to answer, and the reason for this is the answer changes depending upon who you ask. I might be jaded, but the more you worry about the state of the hobby the more your enjoyment of the hobby is impacted. Let's be frank, no sane person should become a publisher. You will make very little money, you will toil in obscurity, you will be attacked for decisions you make, or do not make. When you have success, you will never enjoy it because someone is always looking to criticize you. That being said, I love games and love designing games. What I see happening, is the same thing I have seen with this hobby since I started. We are chasing our own tail: d20 hits, and then we have a boom bust. Magic the Gathering is released, and then we have a boom bust. Vampire hits and everyone and their uncle try to do their own take on this. Retro clones? Boom. Bust. Bust in ideas, bust in creativity. Now, we have Kickstarter. We are walking down the same path as we did with everything. The same mistakes are being made with eyes wide open. I might be the wrong one to ask, or I might be bitter. I want more Stars Without Number, and less rehashes like Delving Deeper. BD: What are some of the challenges of designing for a historical setting? RI: Knowing when to stop with layering of the historical accuracy. Sometimes you need to not bog down the game with trying to be accurate. Truth be told, if I treated Colonial Gothic like a real historical simulation, there would be huge limits placed on the type of characters allowed into play. There would be no mobility, social or physical. You would not have mixing of social classes, let alone mixes with genders. You would have rampant intolerance. This would not be fun. BD: How much does your academic background shape your work on a game like Colonial Gothic? RI: To be honest, it helps me with research, knowing the difference between a good primary source and a bad source. My academic background gave me the desire to use what I know in order to design a game that I love. BD: Are there particular things you look for when trying to identify good sources? Can you elaborate and talk about the pitfalls of bad source material? Particularly in the age of the internet, the abundance of historical information can be overwhelming for people. It all goes back Old School. The days before ubiquitous web access and instant reading for any information you may want, or don't want. The way I learned was the way most my age learned, using paper sources. So let's break it down into two parts: scholarly articles and primary/secondary sources. For articles I focus only on scholarly ones. Even then I pay attention if an article is from a peer reviewed journal or refereed journal. What's the difference? Peer review articles have to pass reviewers who are experts in the field or on the research topic found in the article. Typically these reviewers do not know who the author of the article is. Conversely, refereed journals must be reviewed by scholars or experts in the research topic of the article who are not members of the board or editorial staff of the journal. When I am doing research I stick to either type of article, but avoid at all cost general interest magazine articles. These tend to be sparse with research and long on long winded popular topics. A secondary source is basically one providing interpretation and analysis of historical events or phenomenon. They one step or more removed from the event and are generally written by someone other than the individual who experienced the event. Types of these sources are what you expect: books and the like. Now in this age of ubiquitous electronic reference sources, the above is still true, and even more important. All of this is internal, and is something that is just ingrained in me. BD: Is there any particular school of thought or even just a single idea in history you find useful to game design? Ok, not something you would expect from a game designer. I am someone who enjoys modernism. 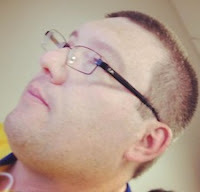 I do not like overly fussy things, and this is applied to the games I design, the graphic design I do, and my outlook. When I design a game, I always think about the whole thing. What is the page going to look like? Font choices and the paper the book is printed on, is going to impact the transmissions of the ideas. What material is going to be used to build the cover, and how is my lighting of this going to affect the look of the cover? Hell, everything I design starts out as a longhand draft, written with pen onto paper. I always think about how the design is not going to be fussy or over worked.